The long wait is nearly over for club teams all around Meath as the club championship gets underway on Thursday the 12th of April, preparations have been in full swing all around the county since early January and most clubs will believe that with a little bit of luck they can reach the promised land. The absence of relegation in the senior and intermediate championship may to an extent take the pressure off some clubs who are building for the future, but with each of the grades quite open most teams will harness greater expectations. Ballinlough will once again aim to capture the Mattie Mc Donnell Cup and since they were relegated from senior football in 2007 they have been continually knocking on the door; only in 2010 have they failed to reach the knock-out stages. Recent league form suggests that they will be in with a real chance again this year and with odds of 12/1 available it could well be worth a flutter, but they will also be aware that they are stationed in the toughest group in the championship and to look any further than first round opponents Longwood could be the catalyst to a very difficult campaign. Gaeil Colmcilles, St. Colmcille’s and Trim will provide the other opposition in the group and it would be fair to say that any of those teams is capable of not only topping the group but winning the championship. Longwood will provide Ballinlough’s opposition in the first round and although ‘The Reds’ were victorious; 0-11 to 0-4, when the sides met in last year’s championship but despite this Longwood are still capable of beating any team on their day. Mickey Burke and Rory Maguire are players who would make most county teams and a run to last year’s U-21 ‘C’ final is evidence that they have talented young players are their disposal. Gaeil Colmcille’s reached the Intermediate final in 2011 and have enough quality to make them one of the main contenders; with Mickey Foley, Philip Ward, Brian Hanlon, Martin Barrett and young players like Seamus Mattimoe and Oisin Reilly in their squad it is easy to see why they are many people’s fancy for the championship. Trim were relegated from the senior championship last year and their pre-championship league form has been patchy but underage structures are good in the town and their minor team captured the Division 2 championship last year, with players like James Toher beginning to make an impact at adult football and experienced campaigners like Brendan Murphy, Paul Gilsenan and Michael Lowther within their ranks they could be among the dark horses. 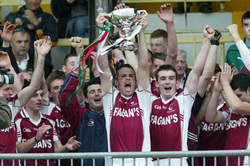 Na Fianna is another team who are capable of beating anyone on their day; as Ballinlough found out last year. However consistency has been a problem for the Enfield/Baconstown outfit and a quarter-final defeat to Dunderry last year was a premature ending to a potentially successful campaign. A heavy recent defeat to Ballinlough may have given the impression that Dunderry won’t be a major force this time round but the absence of key players in that fixture was a major factor. Meath minor panelists; Alan Garry, Paddy Kenneally and Stephen Coogan will add enough pace to put Dunderry among the front runners again this year. Neighbours Carnaross have made an impressive start in Division 3 of the A-League and with Niall Mc Donnell, Declan Reilly and John L. Magee in their attack they have enough scoring power to be a threat. Available at odds of 25/1 Syddan provide good value, last year’s highlight was the defeat of Gaeil Colmcille in the group stages. Former Meath coach Eamonn O’ Brien is now in charge and they have made a solid start to their Division 3 A-League campaign. Backboned by the Dillon brothers they could be still in contention when the championship gets down to the knock-out stages. However trying to pick the winner in the Intermediate Championship can be a futile exercise; despite all the predictions and debate a winner could come from anywhere, not too many people would have predicted Moynalvey to win the Mattie Mc Donnell Cup before a ball was kicked last year.